Are you a programmer, statistician, or data analyst tasked with generating reports? 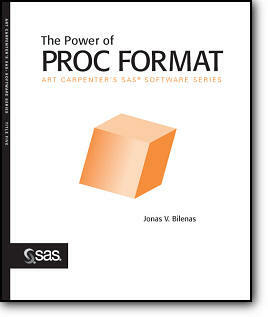 Discover how you can put the powerful FORMAT procedure to work for you with The Power of PROC FORMAT. Written in an easy-to-follow tutorial style and illustrated with real-world examples and solutions, this handy guide introduces beginning to intermediate SAS users to the functionality of the FORMAT procedure. Learn how the FORMAT procedure can recategorize data values while doing a variety of tasks, including building user-defined formats and informats, implementing a table lookup in SAS, using the DATA step and other SAS procedures, assigning descriptive labels to data values, creating new variables and finding unexpected values, generating data extracts, and merging data sets.